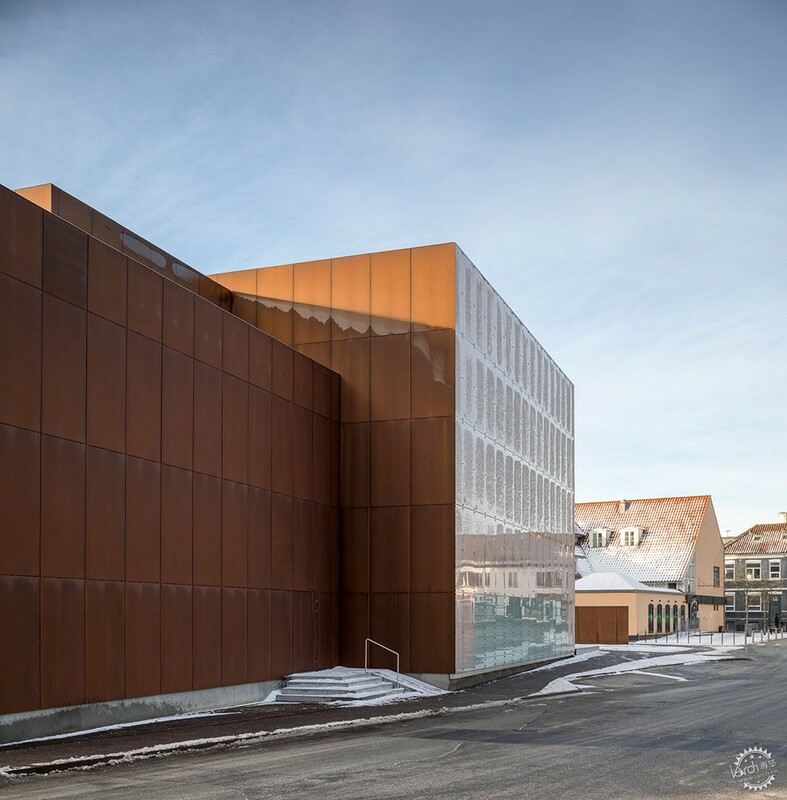 Schmidt Hammer Lassen Architects designed this theatre complex in Hjørring, Denmark, as a series of Corten steel cubes, but has covered some of the rusty walls behind a layer of frosted glass. 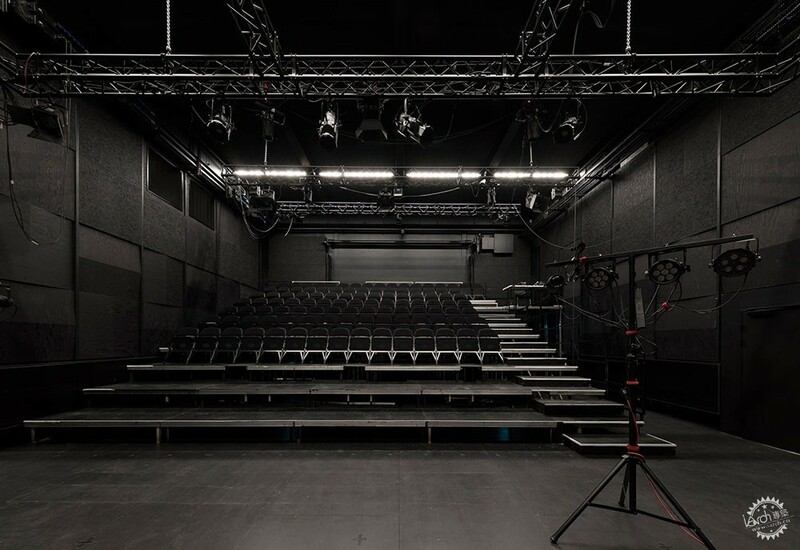 The 4,200-square-metre Vendsyssel Theatre and Experience Centre includes a music hall, rehearsal hall, a 430-seat theatre, and a workshop and dressing rooms arranged in several rectilinear blocks. Some of the volumes in panels of Corten – a type of pre-rusted steel, also known as weathering steel. Some of these surfaces are covered in frosted glass, with colour-changing LED lights sandwiched in between. 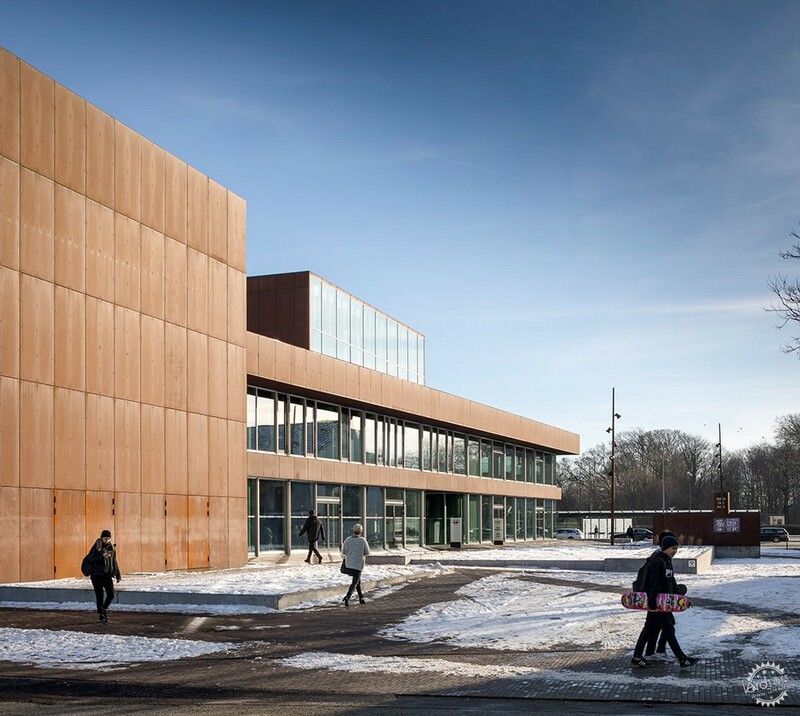 The Danish firm, which won a competition in 2013 to design the cultural complex, chose the mixture of materials as a reference to the brick and plaster facades that typify Hjørring's surrounding architecture. "It is our ambition that the building will manifest itself as a new living organism in the cityscape," said architect John Foldbjerg Lassen. 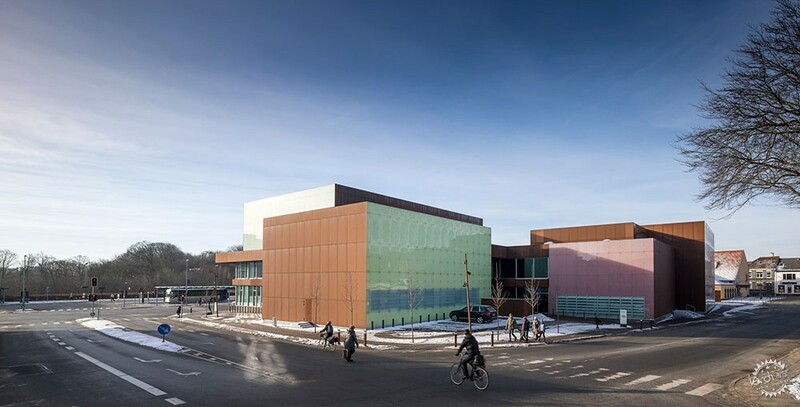 "It is a building which stands by its cultural significance and which dares to be different without taking focus away from the town's existing qualities." The plaza in front of the building is intended as a venue for different types of events and activities, as are the open-plan lobby and large staircase. "Space has been created for both scheduled and ad-hoc events outside at the plaza, inside the foyer and on the grand staircase where visitors can choose to be spectators or even participates in the activities," said the architects. 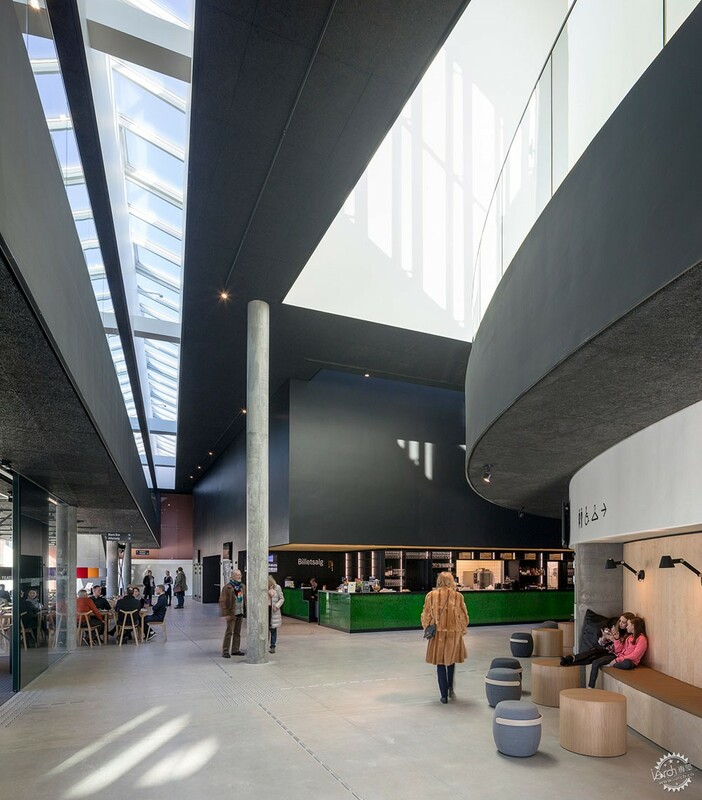 The open-plan layout inside the building, as well as windows into performance spaces, allow views between the different areas. "We've designed emphasis on the interaction between artists and spectators," added the team. 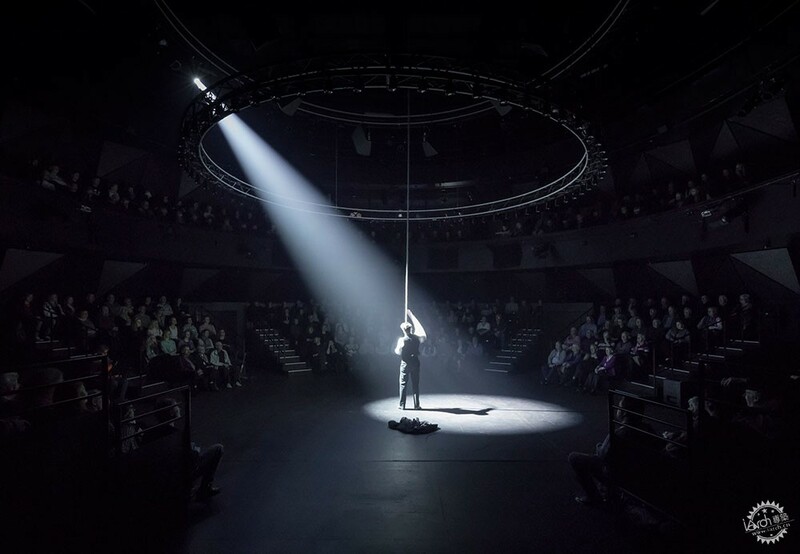 "Inside, all the major halls can be opened to the foyer, the use of glass and windows in different rooms creates visual connections and the performers can get a glimpse of the public from their lounge on the top level." 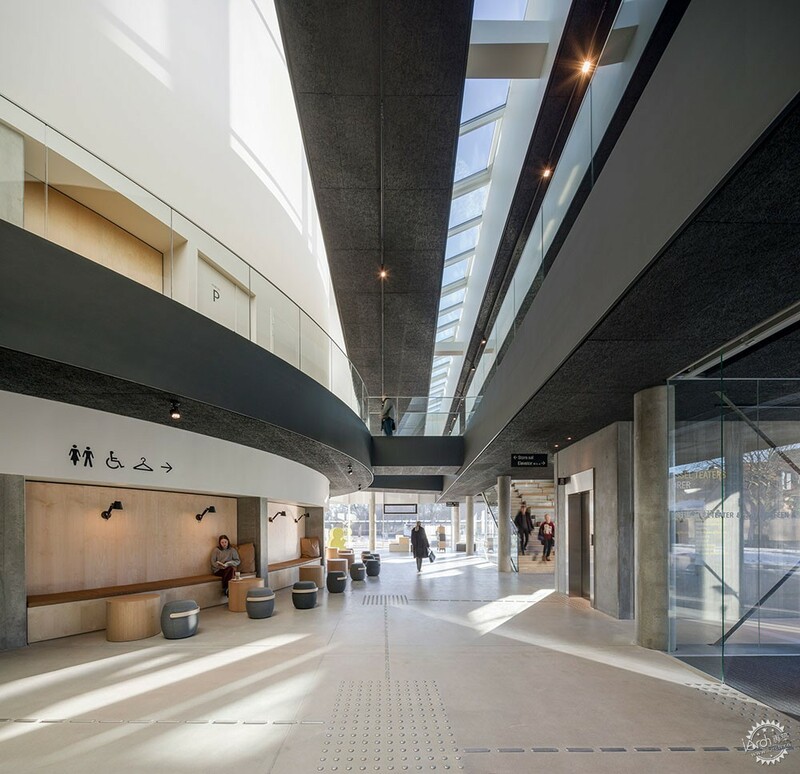 Glazed walls run along the front of the building to bring plenty of light into the lobby and cafe area, which is also topped by a long skylight. The curved end of the theatre, which juts into the lobby space, features wooden benches carved into its lower level. On the floor above, a raised walkway with glass balustrades leads to the technical rooms and offices with views to the space below. 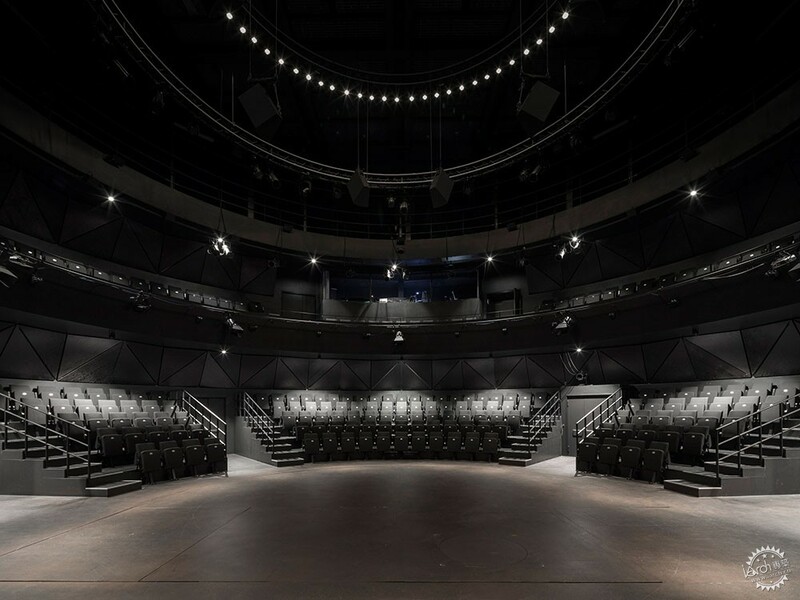 The theatre features completely black interiors with seats are arranged in the round. Seats in the second auditorium, which is also completely black, are forward-facing. 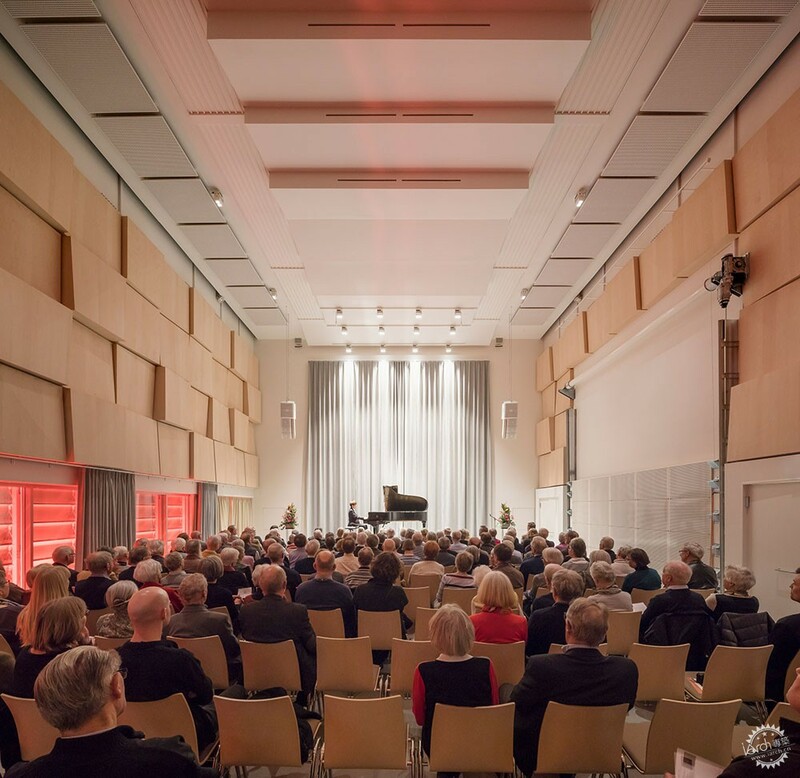 The musical hall has lighter interiors, with blocks of wood lining the walls. On one side, the lower part of the wall is open to reveal the LED lights slotted behind the facade. 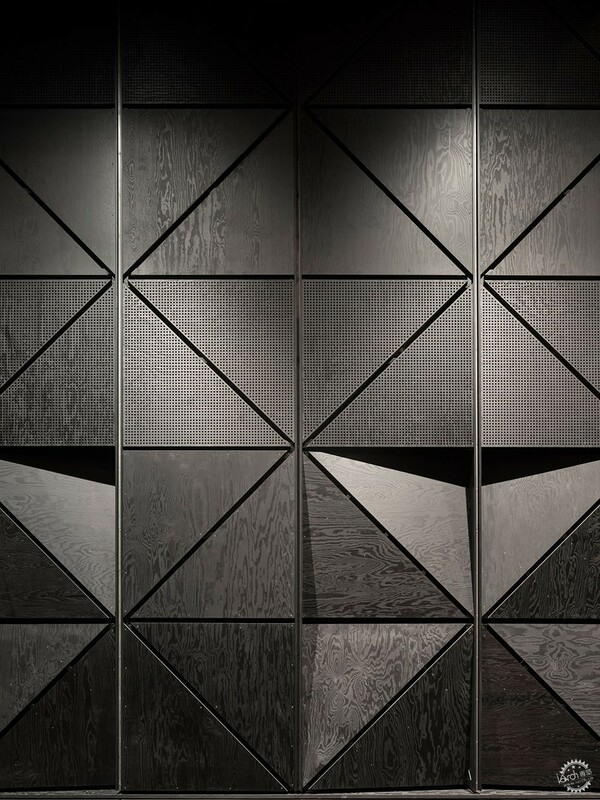 Schmidt Hammer Lassen was founded by architects Morten Schmidt, Bjarne Hammer and John F Lassen in Aarhus in 1986. Other projects by the firm, which now has offices in Copenhagen, Shanghai and London, include Scandinavia's largest library, a titanium-clad cathedral in Norway that spirals up towards the sky and a canal-side cultural complex in Sweden.